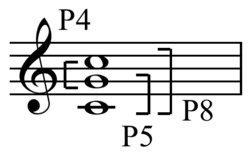 Side-slipping complementation: C7 chord/Lydian dominant scale (chord-scale system) and complement Play . In set theory the traditional concept of complementation may be distinguished as literal pitch class complement, "where the relation obtains between specific pitch-class sets", while, due to the definition of equivalent sets, the concept may be broadened to include "not only the literal pc complement of that set but also any transposed or inverted-and-transposed form of the literal complement," which may be described as abstract complement, "where the relation obtains between set classes". This is because since P is equivalent to M, and M is the complement of M, P is also the complement of M, "from a logical and musical point of view," even though not its literal pc complement. Originator Allen Forte describes this as, "significant extension of the complement relation," though George Perle describes this as, "an egregious understatement". ↑ Blood, Brian (2009). "Inversion of Intervals". Music Theory Online. Dolmetsch Musical Instruments. Retrieved 25 December 2009. 1 2 Whittall, Arnold. 2008. The Cambridge Introduction to Serialism, p.272. New York: Cambridge University Press. ISBN 978-0-521-68200-8 (pbk). 1 2 3 4 Nolan, Catherine (2002). The Cambridge history of Western music theory, p.292. Thomas Street Christensen, editor. ISBN 0-521-62371-5. 1 2 Berger, Cayer, Morgenstern, and Porter (1991). Annual Review of Jazz Studies, Volume 5, p.250-51. ISBN 0-8108-2478-7. 1 2 Perle, George. "Pitch-Class Set Analysis: An Evaluation", p.169-71, The Journal of Musicology, Vol. 8, No. 2 (Spring, 1990), pp. 151-172. http://www.jstor.org/stable/763567 Accessed: 24/12/2009 15:07.